An Alaska cruise is certainly on the ‘bucket list’ of any serious cruiser. The spectacular scenery, fun and enriching shore excursions and wealth of pre- and post-cruise options make this an ideal cruise destination. The vast wilderness experience of Alaska, with its towering snow capped peaks, endless forests and abundant wildlife dwarfs even the largest ships. The mirror-still waters around the glaciers are calm and serene until a cannonade thunders out across the bay when tonnes of centuries-old ice tumble into the sea. It’s a spine-tingling and humbling experience all at once. Most visitors experiencing this natural wonder will be aboard one of the large ships that regularly traverse the most common route between either Seattle or Vancouver and either Seward and Whittier in Alaska. If you’re a fan of the bigger ships, then your choice is Carnival, NCL, Princess, Royal Caribbean, Celebrity or Holland America from Seattle or Carnival, Disney, NCL, Princess, Royal Caribbean, Celebrity, Holland America, Oceania, Crystal, Regent or Silversea from Vancouver. Frankly, it doesn’t make a great deal of difference at the eastern end. Both cities have excellent air links, hotel offerings and plenty to keep you occupied if you’re extending your stay. For Aussies, you could argue that flying directly into Vancouver (Canada) has the advantage of more direct links with Sydney (Air Canada AC) and a friendlier arrivals process. Transiting through Los Angeles (LAX) and connecting to Seattle can be a bit nerve racking if your timing finds you smack in the busy periods. Alaska is, predictably enough, served by Alaska Airlines which hubs out of Seattle and flies to almost every dot on the Alaskan map along the Inside Passage. If you had to ask me, I’d say fly AC, depart your cruise from Vancouver and exit the USA via Anchorage for smoothest processing and easiest transfers. 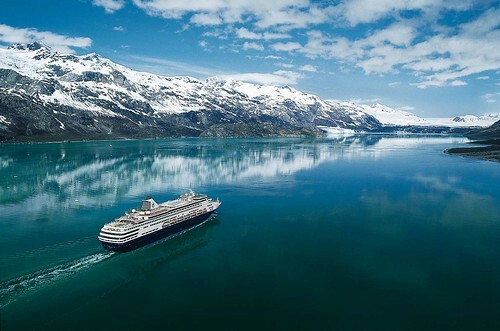 The Alaska cruise season stretches between April and September. I say stretch, because at the extreme ends is when weather could interfere with your vacation enjoyment. So from June to August are the prime months with the best weather and, of course, that’s when everyone wants to go. Where do the ships stop? The big ships make just a few port calls en route and most of the experience is viewing the spectacular scenery from the open decks in between dashes to the buffet and back. Here’s a few of the most popular ports. Juneau: No roads lead to Juneau, so the Alaskan capital has a mysterious remoteness. It’s a delightful town with its bounty of water, forests, and mountains. Squeezed between the Gastineau Channel and Coast Mountains, Juneau offers a lot of variety in close proximity. Visit the massive Mendenhall Glacier amid the vast Tongass National Forest. Ketchikan: This scenic town is right out of a postcard and clutches the shores of the Tongass Narrows, with many shops and houses built right out over the water. The stairways are weathered and the vibe is cheerful in the town that calls itself the Salmon Capital of the World. There’s the Tongass Historical Museum, Totem Bight State Park and Saxman Village. Glacier Bay: Now, you might not be getting off the ship, but you’ll certainly crawl at a tantalising pace in this UNESCO World Heritage Site that protects a unique ecosystem of plants and animals living in concert with an ever-changing glacial landscape. Keep your camera at the ready and you may catch great chunks of ice calving off the glacier. Glacier Bay has more actively calving tidewater glaciers than anyplace else in the world. Sitka: The onion domes of St. Michael's Cathedral are your first clue that Sitka was once a key Russian settlement. Indeed, it was capital of Russian America, seat of the bishop of Kamchatka, and the most important port on the West Coast for the first half of the 19th century. Catch a performance by the New Archangel Dancers and be greeted by the handsome native Tlingit people. Skagway: This once boom town looks like the set of a movie. So many 19th century goldrushers set up shop as provisioners that Skagway was the largest city in Alaska by the turn of that century. Booms may fade, but you can still ride the antique White Pass & Yukon narrow-gauge railway, step into the Red Onion Saloon or peruse the restored buildings and wooden boardwalks of the Klondike Gold Rush National Historical Park. It’s a long flight over the Pacific, so you’ll want to make the most of time and one of the most enriching experiences you could possibly undertake is to combine the famous Rocky Mountaineer Rail journey through the gorgeous mountains of Canada with a top notch Alaska cruise. Do I know of such a thing? Well, yes, I do. Holland America Line and Rocky Mountaineer have joined forces in a very sensible amalgamation of products that deliver the very best of both sea and land experiences. In fact you can combine any Rocky Mountaineer rail package through the Canadian Rockies with an Alaska cruise on Holland American Line's ms Zuiderdam or ms Westerdam. Here’s just one great value example. Beginning in Calgary, spend three days aboard the Rocky Mountaineer travelling to Seattle where you spend the next seven nights on an Alaskan cruise aboard ms Westerdam. The whole shebang includes seven dinners, eight lunches, ten breakfasts, eight nights’ hotel accommodation plus North Vancouver and Banff tours, Yoho Park tour, helicopter flight-seeing with all station and hotel transfers. For 15 days and 14 nights, the price is US$5,116.